This is the personal portfolio website of Dom Price (forgive the third person), a digital media artist, programmer, and freelance contractor from Pensacola Florida. I am a freelance graphic designer and computer application developer with more than ten years of experience in a variety of internet and computer related fields including but not limited to Web Design, Web Application Development, Simulations, Interface Design, and 3D Modeling. Over the past ten years, I have built up a substantial portfolio, having (literally) worked on more than one hundred websites and creating more than three dozen from the ground up. This site is a showcase for that work. Pardon the website if it acts a bit wonky. I've been constantly updating it's functionality. Happy Friday the 13th. Yesterday in a fit of boredom I decided to flex my Flash muscle. For the first time in over a year I made a flash game to see if I still had it. Oh yeah... You bet I do. 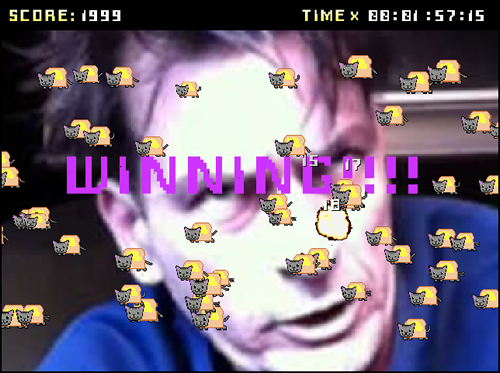 I made a game in response to the "Nyan Cat" meme everyone seems to be all in a tizzy about. Click the image below to see what I'm talking about. I need to gather up all of my functional and code related projects and find some way of presenting them on this site. It's a real pain to try to explain to a client what you're capable of doing when the bulk of your work is behind the scenes. Apologies for neglecting my updates of this site. I've been swamped at my current job over at Coco and have been working on preparing a tour with Finite Automata. I have managed to put together a partial press kit here. It features some of my personal artwork which the band and I have agreed fits the groups overall theme very well. I am pleased with the direction we are going in, and the only issues now are monetary; as planning a tour is extremely expensive. On the home front I have been doing a good deal of design work for Coco. Mostly in the bland corporate style I am none to thrilled with. I have also been working with my myspace associate John Spinelli on the website for his project Ghost in the Addict. It has been progressing slowly, but well. Yeah, I know. It's been a while since I last updated. Three months to the day however I have been busy as hell. I've been working closely with both Coco Design and Tinbu on their respective projects and as a result have become heavily involved with the Open Social platform and XML feeds. Both of which are skills that I hope to implement on new projects. I've also been working closely with Wild Child on his new site. He's opted to use my CMS framework that I have designed for use on other sites including Suni D Photography and TnC Photography. I really need to get some of my recent programming work into my portfolio, however it's tricky without a visual representation of the projects. I've been hard at work with our band Finite Automata on our new Album, and we are in the process of recording it. Hopefully it will be finished by the end of summer. We're DIYing the entire thing from start to finish because we're poor starving artists. A site I designed last year with Coco Design Associates, Houdini Custom, won a Bronze ADDY award in the HTML/Website category this year from the Pensacola Bay Area Advertising Federation. The site was designed by me and was part of a collaboration with Coco. I just added a new poster design to the print section. It's a poster I did for Vomit Gun and Finite Automata for their late December show at Sluggos. Enjoy cretins! I recently began working with TinBu LLC here in Pensacola in addition to my work with Coco Design. I'm hoping that this will open the doors for new opportunities in the future. I've been focusing a lot on my work and have been constantly busy. However I am always on the lookout for new ventures. I will be putting more of my programming work up soon as well. I have a few pet projects that I haven't quite figured out how to present in a portfolio format. I am also going to be working on the photo gallery as well. Finally got the Concubine and Goofy Golf prints up. Also check out some of the new stuff in Eyecandy. I put up some collages and drawings I've recently done. Google Maps API really is a lot of fun to play with. I have successfully created an prototype world map for an online socio-political game. Only downside is the mechanism for creating individual tiles is a bit cumbersome, so it only zooms in to about a power of five. I will put it up along with some flash projects later this week. I have found a lot of the flash games I made from my days on Mobiusfactor and Newgrounds and have decided to put a few of them up in the function section. Some of you who haven't been able to play them all these years may be delighted to know they'll be playable once again! In other news, I have gotten a few new gigs here in town and will be beginning work on those projects. I have recently finished integrating TnC Photography, which was not designed by me, however it runs on the Kraftwerk CMS and Framework which I developed from scratch, and my site and a few other sites run on, including Suni D Photography. Been adding more stuff to the new site. The portfolio is going to be constantly added to in the coming weeks. Please keep checking in for new stuff. Well I finally launched my new design. It took me long enough to get it up. The new format allows for a better look at my works, and is a little more user friendly. It's a little easier for me to update as well. I am also working on a better CMS for this site. For the time being I am manually updating the database, which is cumbersome to say the least.